Every room in a renovation needs a starting point - for our master bedroom it was our floral wallpaper, in our kitchen it was our copper tapware, in our bathroom it was the built in bath. It is the first design decision that everything else is considered against. The point of difference in the living room is that my starting point is the last thing you add to the room - the furniture. I don't mean a furniture floor plan, it is more calculated. The accent colour of cushions influenced the wall colour I selected, the placement of the TV determined how we repositioned a window, the tone of the wooden furniture impacted the finish I selected on our hardwood floors. I have found the best way to renovate and design a lounge is when you know exactly you want to furnish it with. While Caleb would love it if I never walked into a furniture store again (for the sake of our bank account), I am inspired by furniture pieces that help me design beautiful spaces. Open space in a room is like pausing when you speak, it's the silence in between sentences that create impact and help people process what you are saying. Empty spaces can do wonders in a home. 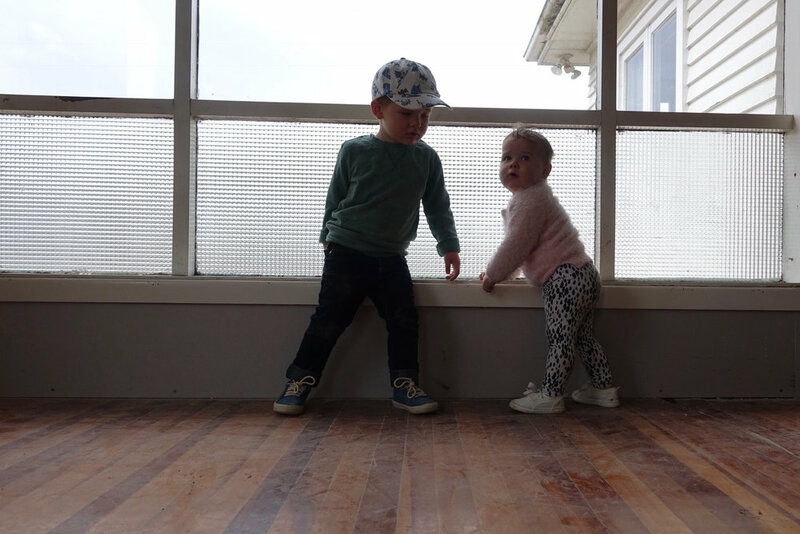 Empty space creates room to live - in our case it directs foot traffic in our open plan living, creates space for the kids to play and allows the potential to open up the whole room if we are entertaining. 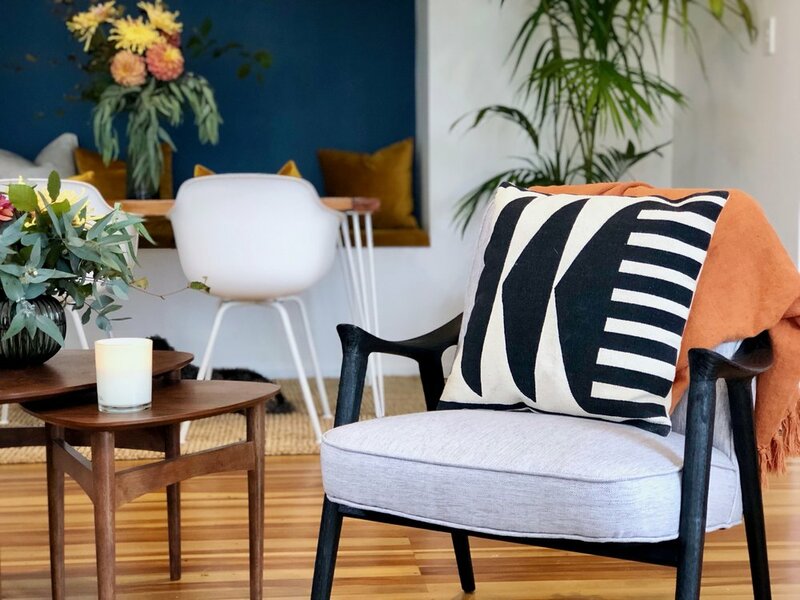 The Fergus Armchair by Nood with it's mid century flair paired with walnut Ode Nest Tables were the perfect addition to the centre of our open plan living without imposing or taking over. We decided to remove the original large window to make way for a much smaller option, which gave us wall space for our TV and Walnut TV Unit. The white walls partnered with the white venetian blind creates a simply background for our gorgeous leather couch take centre stage. Mid Century style focuses on earthy tones and natural materials - so this leather couch ticks all the right boxes. Plus it will stand the test of time with children! It's the final decor touches that are as important to furniture, as icing is to a cake. The throws and cushions create depth + texture to the seating areas, as well add comfort and warmth. The floral arrangements and pot plant brings colour and another natural element to the room. Finally the pattern in the cushions and artwork brings boldness, energy and a sense of fun to the space. As usual we have a summary of all the costs and design details listed below. It’s important to note that tradesman breakdowns are not exact. It’s an estimated split from overall work on the house. All prices include GST. Posted on April 19, 2018 by Alice Pearson and filed under Renovation and tagged relocatable house renovation roomreveal relocatable reno Interior Interior Design interior styling mid-century mid century interior design living room lounge floors Colour Scheme Pearson and Projects pearsonandprojects.